Westside Waterfront Paradise w/ith private beach. 3 bed, 2 bath. 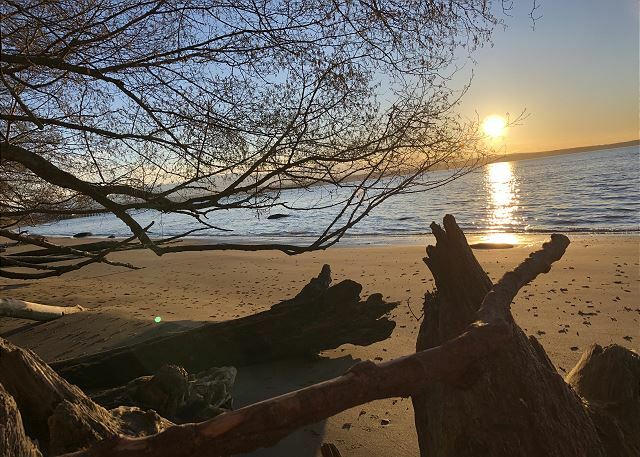 Spyglass Beach House, formerly known as Point Place is a three bedroom, two bath home located on the water at Bush Point with huge breathtaking northwesterly views of the Puget Sound, sea life, big ships, awesome sunsets and stunning Olympic mountains. Perched on a small bluff for added privacy just 23 easy steps to 100’ of private sandy beach below. It’s a perfect spot for whale watching, spying seals and seal pups, bird watching (Bald Eagles nest nearby), ship and submarine spotting, fishing, boating, kite flying or just roaming the adjoined Smugglers Cove beach. This beach is a particular beach combers paradise! (New owners as of 3/19 have updated much of the property and the items within. All new bedding, all hypo-allergenic bedding, gel infused mattress toppers, dense sleeping pillows, all new towels, all new Green Life healthy cookware, bakeware, dishware, almost all small appliances switched out for new ones. Lots of Lighting added, storage added, rugs replaced. New gas BBQ. New cleaning service, plantings, and so much more! They read reviews and tried to address any challenges mentioned. The house has a beautiful large view deck over looking the water, perfect for relaxing and dining. Master suite has a balcony and walls of windows to take in the view. Convenient public boat launch is next to the property less than 100’ away. There is parking for three cars on the property and public boat parking on a first come, first serve basis, across from the boat launch. The South Whidbey State Park is just a 5 minute drive or ~30 minute walk away. Wineries, restaurants, grocery store and cute shops are in downtown Freeland about a 10 minute drive. There are nearby historical sites, parks including Fort Casey and Fort Ebbey, public gardens, leash free dog beach, parks, and trails also within 10 miles from the home. Langley is about 12 miles away. The house features a full bath and king bed in the second floor master bedroom, with sweeping views of the cove and Puget Sound (Note there is no door separating the first floor and second floor bedroom, but it is quite private and bed cant be seen from below.) The first downstairs bedroom houses a queen bed, built in large wardrobe and also features views of the Puget Sound. There is also a double bed in the 2nd downstairs bedroom for additional guests, also with a built in wardrobe and this bedroom adjoins the downstairs bathroom; there is also access to this bathroom through the laundry room. In addition, suitcase racks are available for all guests. The house features many modern amenities, including; a fully stocked modern kitchen, cable TV+DVD, Netflix, Hulu, washer/dryer, dish washer, gas and charcoal grill, great sitting couch as well as several reading spots. Private Master Suite balcony is perfect for enjoying a sunset. During high fishing season in August, it is a popular place to fish, you can fish directly from your beach where salmon are known to often hug the shore, so bring your tackle and prepare to eat fresh fish, but note that the beach can become a bit busy at that time. 4 NIGHT MINIMUM JULY AND AUGUST ONLY. 2 DOG MAXIMUM. Fold Away baby crib and highchair are available through the property management upon request. Beautiful house on the beach, clean and well maintained. Very important and for large part ignored in other properties is good, comfortable seating inside when you want to lounge at the end of the day. This house has that covered as well. Views are stunning. Thank you for your comments. We are happy you had such an enjoyable and comfortable stay on Whdibey Island. WE hope to help you with your next stay on the Island. Spectacular view and beach access! We were absolutely blown away by the view! Wish we could have stayed longer because I would certainly have done more walking on the beach. The house was the epitome of a a seaside home. The owners should know we were VERY impressed with the attention to detail of the decorating from all the cute tchotchke to the amazing amount of turquoise kitchenware. (How in the world did you find that much of it!). By the way - the kitchen was very well equipped. Also - so many thoughtful touches to make your stay more comfortable. We didn’t have our dog with us but there was even a gadget for cleaning your dog’s paws! The only complaints we had was that the coffee pot needed some serious cleaning and the BBQ grill had been used and not cleaned. Otherwise - very clean. We went to Meerkerk Gardens, Coupeville and Deception Pass and enjoyed all of those excursions. Thank you for you comments. We are so happy you were "blown away by the view" and we can arrange for you to stay longer next time! Thank you for your comments on the coffee pot and grill, we make an effort to make sure our houses are clean so appreciate the feed back when something is missed. We hope we can help you with your next stay on the island. Loved the beach access, functional kitchen and dining area. The layout is a bit awkward with the downstairs bathroom (you have to walk through laundry room) But it works. Thank you for your comments. We are so happy you enjoyed your stay on Whidbey Island and hope to help you with your next stay on the Island. What can I say...we had an incredible stay at this beautiful home. Everything was as described but descriptions of the views fell well short, they were better than any description!!! Don't miss the sunset. Very clean with everything you need for a relaxing stay. Management was quick to respond to our request for an early check-in. I would absolutely recommend this property to anyone. Thank you for your comments. We are so happy you had such an enjoyable time and had such a pleasant stay on Whidbey Island. We hope we can help you with your next stay on the Island. As most have stated before, it is a weird set up with the bedrooms and bathrooms and could use a bit of renovation but who cares! The location and views are amazing. Thank you for your comments. we hope you enjoyed your stay on the Island and look forward helping you with your next stay. My husband and I stayed here for one week in late August. We greatly enjoyed the views of sunsets, ships, boating and fishermen. Great views from both the main floor and upstairs master bedroom loft. The kitchen is adequately equipped. The pm notified us of the broken cooktop ahead of time and provided a portable cooktop. The oven still worked, but was tricky to turn off, so hopefully the whole range will get fixed or replaced for future guests. The main floor living room is spacious and has a very comfortable sectional and modern TV for viewing Netflix, etc. plus cable stations. The main dining table works well, but I needed to move a floor lamp next to it since there is no overhead light. We slept in the master which is located in the upstairs loft. The view from there is just spectacular as you are surrounded by two walls of windows! I was glad to have eye shades as the morning light will wake you up on a sunny day. It was also fun to hear the crashing waves as the tide came in, but sometimes I slept with earplugs just to tone down the wave sound. The king bed was comfortable and supportive. The main issues we had in the master and master bathroom was the old carpet that had lots of ground in dirt stains. The master has two closets with hangers, but no dressers so you need to leave folded items in your suitcase. The main deck downstairs has 6 comfortable dining chairs and a round table that seats 4. The upstairs deck has two resin lounge chairs that are comfortable to relax in. The beach is accessed right off the deck down a short flight of stairs. During our stay fisherman would arrive each day and fish from the beach in front of the house. They were quiet and interesting to watch. The beach area stretches far to the north and has very few people on it, so it’s very peaceful to explore. Overall we had an amazing time. The location, the views, the beach, and the house in general are fabulous. When we arrived we found the stove had a paint stick & placed across the top with words NO! NO! NO! written across it. Accompanied by a hot plate on top. When we rent a house with a kitchen I expect a working stove. Not the end of the world, but it making our meals a challenge. The oven did work, but never really got hot. We tried the BBQ instead. The gas grill had so much gunk built up,it took me a 30 minutes to clean it out before we could use it. The charcoal grill had been used as a fire pit previously with burnt duraflame logs inside. As the week progressed I found blueberries, ibuprofen pills, and puzzle pieces underneath the tables, couch,and the tv cabinet. None of these things we had or brought with us. I think it just needs a thorough cleaning and a new oven. Probably would stay here again if those things happened. The deck and beach are amazing. The views and sunsets are perfect. We are so sorry for your experience! The stove top did break and was fixed. The home did received a deep clean after this rental. This home was sold and new owners have made it an even better rental for guests spring 2019. The home is located at Bush Point, a small beach community. The sandy and stoney beach is down a short staircase, and aside from a few fishermen, is pretty private. The view is northerly, and in the afternoons, the wind whipped up. The home is tastefully appointed and the views are grand. There were a few amenities lacking, which I told the management company about (vegetable peeler, rubber spatulas, patio umbrella for those scorching evenings, beach chairs) and the knives are pretty dull! (not uncommon for rentals). But the sofa is comfortable, the wifi is good, and the TV has Netflix and Amazon Prime. The grocery store in Freeland, Pay Less Foods, has a great selection (did NOT need to shop on the mainland!) It is a bit of a drive to the towns (15-20 minutes), but if you want a quiet getawa and like listening to the waves lapping,, this is a great spot. Thank you for your comments. We are happy you enjoyed your stay and accommodations on Whidbey Island. We hope we can help your with your next stay on the Island. We really could not be happier about our stay at this home. Our family includes young children and the home was the perfect combination of laid back and activity. We enjoyed being right now the beach and took daily walks and had many picnics along the short. Bring from the midwest our children fell in love with the ocean and even went swimming (in the very cold water). The house beautiful, in particular the upstairs room! The only suggestion I would make it in relation to the kitchen. Our family loves to cook and the kitchen is missing a few items that would be helpful for families or groups that plan to cook (a few mixing bowls, liquid measuring cups, griddle...etc. We also found the location to be a perfect base for exploring the island. We would return in a heartbeat! Thank you for your comments. We are happy you had such and enjoyable stay on the the Island, this is a beautiful place and I'm glad your family wants to return. We were very happy with the location of the home. The view is just amazing ! We could have had a better experience had the home been updated/ remodeled. The cleaning crew does on the surface cleaning ( changes linens, towels, vacuuming), but the deep clean is long overdue. When we arrived the home had a musty smell like the old house, the smell mostly went away after we ventilated the home and lit the fire place. All in all we had a good stay. Thank you for your review! We apologize that the home was not cleaned to your liking. We will definitely resolve the issue and have the home deep cleaned for our future guests. We appreciate your feedback and we hope you'll come stay with us again soon! We had a lovely weekend on Whidbey Island. The house was a bit older then I expected, but still well kept and had everything we needed. The view was amazing, the house is spacious and the access to the beach is hard to beat with less then 20 steps to the ocean. We had 6 people, 2 of those small children and it worked great for us. Beds were comfortable, kitchen was updated and had everything for cooking. The bathroom setup for the two extra bedrooms was a bit odd, but nothing we couldn't work around. Only suggestion is to upgrade the bathrooms and upgrade the outdoor furniture for enjoying the view more. Thank you for your comments. We are glad you had a "lovely weekend" on Whidbey Island. We hope we can help you with your next stay on the Island. perfect in every way. Clean, welcoming, comfortable, excellent amenities, great weather, quiet, private. loved it so much!! beautiful views, excellent location. Was an easy process,the staff at Tara were wonderful! Thank you for your comments. We are happy you had such a good time on Whidbey Island. Please let us with your next stay on the Island. Overall a very good experience. The view is phenomenal. I just wish the master bath would have been renovated. Thanks for your review. Nice to hear you had a great time. We do have some spectacular views on Whidbey Island. Our family came for a getaway over spring break and had a wonderful time. The home was clean, great updated interior and was exactly as described in the website. The only minor drawback was that the kitchen water pressure was pretty low. I'm not faulting the property for that, or downgrading my review, but it's nice to know going in. Kitchen seemed to have everything we needed. The view from the living room, kitchen and upstairs bedroom was amazing. Would recommend this property. Thank you for your review! We are happy to hear you had a great spring break in one of our vacation homes. We have some fabulous views here on Whidbey Island. Nice to hear you had a great time! I booked this home as a girls' getaway with my mom and sister. The views from both floors are absolutely stunning from every room! We enjoyed walking along the private beach looking for seashells every day. The home was very clean and the beds really comfortable! The location was perfect for visiting the many wineries, distilleries and other attractions Whidbey Island has to offer. I hope to visit again with my hubby and kiddos next time. Thank you for your review. We do have some great beaches for walking and searching for seashells. Nice to hear you got to take advantage of some of the many things to do on Whidbey Island. Overall the house was great and in an awesome location. The views really are spectacular. We were lucky enough to get some sunny days in March to be there but in the summer it would be even better. We were a little disappointed by the lack of window coverings. Other had reviewed that it was a problem and I thought it was fixed but it wasn't. Some windows had them, some didn't, some did but they were broke etc. We rented this house for the 2nd half of our honeymoon in February. At first glance, we walked through the house and found lots of little random things that annoyed us: the light switches that seem to not connect to anything, the footboard of the bed that actually blocks the view, the weird, boarded up fireplace with the little potbelly stove in its place. However, once we got over those things, we realized it was just a nice place to have quiet, relaxation time. Be aware though, if you go in the winter: many of the restaurants are closed Monday and Tuesday, and even when they are open, they close very early. We arrived here on a Monday and ended up eating gas station dinner because it was literally the only thing still open at 9pm on a Monday. Definitely plan ahead for your meals. Or, of course, grocery shop and cook your meals in the kitchen. Overall, the house worked well for us, but definitely is a bit dated and could use some updates. Thank you for your comments. We are happy you had a "nice place to have a quiet, relaxing time". We hope to help you with your next stay on the Whidbey. I rented the home to take my 80 year old parents for a getaway weekend. They were in need of a break from the monotony. The weekend was everything we needed! The view was incredible, the property well maintained and my experience with the management company was positive and professional. They made the process easy from start to finish. I can’t wait to return! Thank you for your comments. We are happy your stay with your 80 year old parents was "everything you needed"! We are are glad you found the view "incredible", "property well maintained" and your experience with Tara Properties "positive and professional". We hope to help you with you next stay on the Island. Excellent Home for Group rental! This home was lovely and very clean. The kitchen was modern and easy to use, the appliances were all top notch, and the living and dining rooms were very conducive for family or friend gatherings with very comfortable furniture. The television and cable instructions were great...and the BEDS WERE FANTASTIC! Excellent linens, plenty of pillows, and high quality mattresses. Plus, the VIEWS. You can't top the view from this home: beachfront, mountains, Salish Sea...everything right outside the large picture windows. I highly recommend this rental for friends, a reunion, two couples, or families. Really wonderful place. The process was easy, too...and when we had a question about the lock, it was quickly and easily answered in one phone call. I really appreciate how easy this rental was from start to finish! Thank you for your comments. We are glad your stay on Whidbey Island was so enjoyable form "start to finish". We hope to help you with your next stay on Whidbey Island. My wife and I stayed here for a little birthday getaway. The location was perfect, the house is quiet, comfortable, and has an AMAZING view. Would definitely stay here again. We are grateful for your comments. We are happy it was a "perfect" location for your "birthday getaway". We would be happy with your next stay on Whidbey. Our only complaint/disappointment was how blackened the wood stove glass door was. As much as we wanted to sit in the evening with a fire we did not bother having one because we would not have been able to see it. Otherwise, the house was perfect for our needs and the master bedroom upstairs was definitely a plus. A working pair of binoculars would have been a nice addition for the morning we were lucky enough to see a pod of Orcas. Thank you for your comments. How "lucky" you were to "see a pod of Orcas". We have passed on your comments to the staff and owner and hope to help you with your next stay on Whdibey Island. Mom and daughter getaway and the house was perfect. The master bedroom view was stunning. We could've spent the entire weekend in just that room! House was clean, well stocked with a great open concept floor plan. Enormous deck we wish we could've used had the weather been warmer! Easy beach access. We thoroughly enjoyed our stay. Thank you for your comments. We are everything about your stay was "perfect". Please let us know when you are coming to the Whibey so we can help with another stay, hopefully the weather will also be "perfect". Marisa from management property was very helpful and made the process very easy for a first time renter. Thank you for your comments. We are happy we made you stay on Whidbey Island easy and enjoyable. We hope we can help you with your future stays on the Island. Fantastic location on Whidbey Island, right on the beach with ever changing views of both sea and the Olympic Mountains. A great base for exploring the island. Thank you for you comments. We are happy you enjoyed your stay and had a great time "exploring the island. We hope to help you with your next stay on Whidbey. This beautiful, quiet home with a stunning view was the perfect weekend retreat. Thank you for your comments. We are happy this home was a "perfect weekend retreat" for you. We hope to help with your next stay on Whidbey Island. Fabulous water view and comfortable home. We enjoyed every minute of our stay! The wood-burning fireplace was a nice bonus. The kitchen was well-stocked making cooking an easy task. The beds were so cozy that sleeping became a luxury. We will definitely consider this property for a future getaway. Property management staff were extremely helpful and prompt in addressing our slight concern. Thank you for your comments. We are so happy you "enjoyed every minute of your stay" and are glad that Tara was "helpful and prompt" addressing your concerns. Please let us know if we can assist you with your future vacations on Whidbey Island. We had a good one week stay on whidbey island this summer. We stayed at this house in August and that is fishing season so the people would arrive before sunrise and stay until sunset on the beach directly in front of the house. There is a parking lot directly next to the house along with a boat launch. We could hear the people arriving very early in the morning which was frustrating. The other thing people need to know is that since this is a west facing home the wind is relentless! There was one really hot day and we were able to sit on the deck and have dinner the rest of the time it was too cold and the temp away from the beach was in the 70s to 80s. The view is beautiful and it is fun to see the large ships I would not stay here again. The house is very nice and a good setup for families with teens everyone had their own space. We were very satisfied with our rental property booked through VRBO. The house and Beach front property was properly depicted in the photos. Conveniently located near our wedding venue at Green Bank and family property in Freeland. We would book again. Thank you for your comments. We are happy you enjoyed your accommodations on Whidbey Island. We hope we can help you with your next stay on the the Island. Thank you for your comments. We are happy the house was a "great" fit for your retreat. Hope we can help you with your next stay on Whidbey Island. Enjoyable stay in this cozy home with a beauriful view. Almost perfect, but could use blinds in the upstairs bedroom. The room is all windows, so in late June, sleeping is difficult. Thank you for your comments on your stay on Whidbey Island. We have mentioned your concern on the blinds to the owner of the unit you stayed at. Hope to help you in the future with your stay on the Island! We had an amazing time at the rental house. The house was spotless and looked even better in person. The view was breathtaking. We enjoyed being away from the city and taking time on the beach with family. We saw a pod of orcas Far in the distance, and we had a couple of curious seals. Overall it was an amazing trip and we would do rent again. We had a relaxing long weekend at the Point Place. Having the beach so close by made our life easier and the gorgeous views from anywhere in the house meant we could always stare in awe at the awesomeness of the salish sea. As a side note, keep in mind that the upstairs bedroom does not have a door so it can be tricky if you have little ones that like to go up and down stairs. As other reviewers have mentioned the kitchen has all the amenities and a bbq awaits you on the porch. So glad you enjoyed a relaxing weekend and that you liked the view! Thank you for noting the upstairs bedroom. It does have an open layout, but the stairs do turn as they go up so it does provide some privacy. Thank you for your review! I can't say enough about how much we enjoyed our stay at this beach-front property. The views were breath-taking, and the house itself was perfectly equipped with everything we needed. My ONLY complaint is that the water literally stinks. Not sure of the source, but purchase bottled water to brush your teeth and hold your nose when you take a shower. Otherwise, you will LOVE this rental. Thanks for your review! We're so glad that you enjoyed this property so much! Yes, we've had guests mention the water a few times. Because this house gets it's water from a well, occasionally there will be a sulfuric smell that accompanies the water. This is completely harmless, but we're going to talk with the owner about the issue and see what can be done. Thank you for mentioning that. We hope you'll come back and stay again soon! Thank you Cheryl for your review. We're so happy you love this home and continue to come back to Whidbey Island. Entered a clean, generous home with a good kitchen, great bedrooms, adequate bathrooms, wonderful fireplace, and great view. Access to the beach was adequate and the area was quiet and peaceful. Grocery store was near by. The staff was helpful and responsive. We are happy to hear you had a great time on Whidbey Island. Thanks for your review. Our family of 6 spent a week here between Christmas and New Years. Had a wonderful time and loved the location. Beautiful scenery and great location. Would definitely return, but most likely in the summer. So happy to hear your family had a great holiday in this home. Thank you for your review. The home was comfortable and the views were stunning. We drank our morning coffee taking in the ocean views, diving birds and bobbing seals. The beds were comfortable, the down comforters very cozy and the kitchen was well stocked for our needs. I enjoyed walking the neighborhood streets as well as the private beach. We found the home perfect and would definitely considering staying here again. I would consider this a 3 bedroom home and there was plenty of room for our family of 5 adults. Thank you so much for your review. We have some beautiful views on Whidbey Island. Nice to hear you loved this home. Very clean home with access to the beach. Loved this rental and will definitely be back. Thanks so much for your review. We are happy to hear you loved this home and will be returning to Whidbey Island. We love to hear you loved your "home" away from your home. Thanks for your review. What a great process- we searched many listings and came across this offering, which turned out to be a fantastic vacation ! Thank you so much for your review. 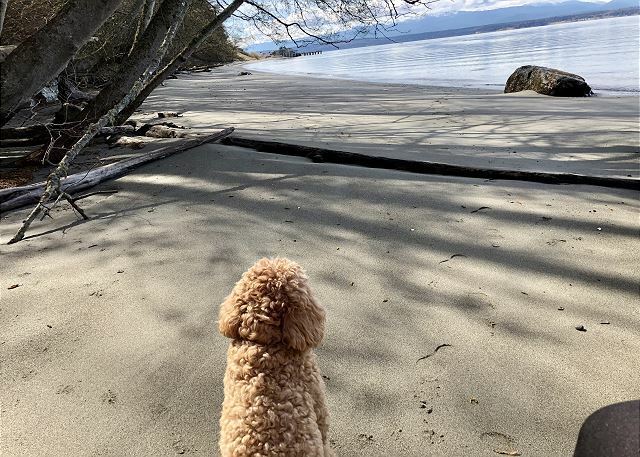 Happy to hear you enjoyed the beach and were able to enjoy Whidbey Island! We loved the house and the location. The house was clean and comfortable. Our grandchildren loved the beach and the large deck. We will defiantly come again. So glad to hear you loved your visit to Whidbey Island and want to come back. Cleanliness is a top priority for us so it's nice to hear you enjoyed your stay.